Closeup of the scaffold on the west side of the tower. The scaffold is more extensive in the map and illustration of Scarlet Moon Hall, but in order to fit the scale of the Dwarven Forge pieces and allow miniatures to fit between scaffold levels, I opted for just two “floors” of scaffold. 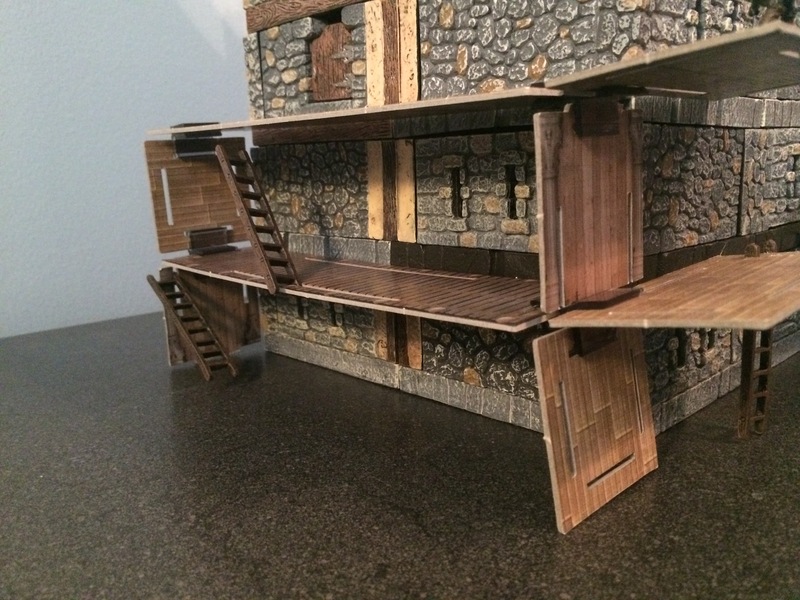 The pieces for the scaffolds came from a variety of D&D Dungeon Tiles sets, but the most useful are found in DU6 Harrowing Halls and DU7 Desert of Athas. Both of these feature “3D” terrain tiles that can be fitted together to form raised platforms, and would have been my method for creating the scaffold had I not hit on the idea to use Terraclips connectors.